The Plantronics CS540 is the most popular wireless headset on sale in Australia. This is lightest wireless headset on the market. You can talk to your customers even when you are 60+ metres from your phone. The CS540 offers hands-free productivity, outstanding audio quality, multi-user collaboration, power-saving features, and style like never before. the same great reliability as the popular CS60. 2 year warranty, even though you probably will NEVER need need it. Streamlined design, improved performance, and great reliability. Both headband and earhook comes in the box, letting you choose (or change your mind). 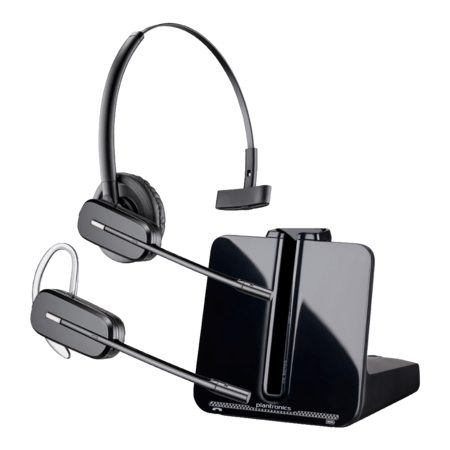 Plantronics CS540 wireless headset is setting a new standard for wireless desk phone communications. The CS540 convertible wireless headset is designed to replace the highly popular CS60. New look, improved performance, same reliability as the CS60. Look great, sound great and feel great wearing this headset. Plantronics bestselling wireless office headset system is sleeker, better performing and as reliable as ever. 70 Plantronics wireless headsets can simultaneously operate in the one office. This can be any combination of CS or Savi headsets. Staff moving to different jobs can simply take their CS540 wireless headset top, place it in the charging base of the headset base at the new location and the wireless headset automatically synchronizes with that base in 7 seconds. 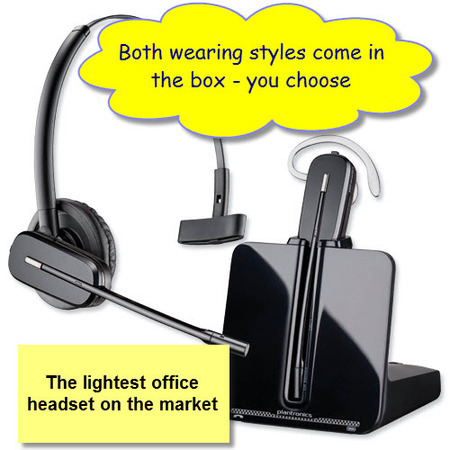 Where staff training is required on telephone calls, the trainer simply places their CS540 wireless headset top into the trainee’s base unit and presses a button on the base. The trainee then presses a button on their wireless headset to accept the trainer being conferenced into the call. Up to 4 staff can conference into the 1 call. For more information, see Plantronics CS540 datasheet & Plantronics CS540 user manual. This wireless headset is identified by the label "Plantronics C054A" printed on the bottom of the headset base.